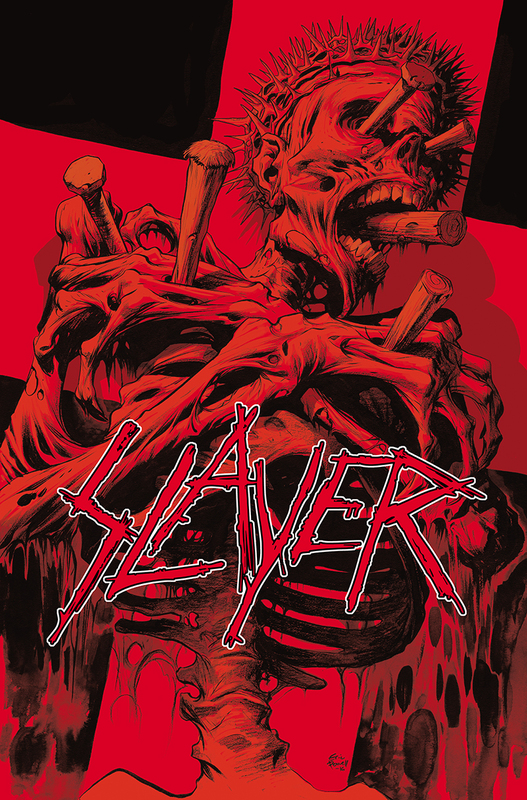 “Dark Horse Comics and thrash-punk titans Slayer have joined forces to deliver a new comic series this holiday season! With full participation from the band and taking inspiration from Slayer’s recent Repentless music videos (filmed in support of their latest album, Repentless, on Nuclear Blast Records), disciple Jon Schnepp (Metalocalypse) will pen the three-issue comic series with interior bloodlines drawn by Guiu Vilanova (Twilight Zone, Conan the Avenger, Weird Detective). Glenn Fabry’s covers reign in blood while postmortem Eric Powell (The Goon, Hillbilly) will illustrate the variant cover for the first issue. The coolest man of Earth, Jon Schnepp will be writing this series. Why am I keep referring to this dude as the “coolest”? I watch his show called Collider Heroes weekly on Wednesdays at the ColliderVideo YouTube channel. The talk show follows everything huge in the comic book culture. The show is funny, geeky, sweaty and just great entertainment value. Please watch it on your free time. Now for the comic. There is no way in hell I am reading this! The image above, alone creeps me out. It looks like a dumb comic for dumb people written by an awesome guy. I do realize this is how the ‘Slayer’ name should be represented, but that doesn’t mean I should like it one bit. Dark Horse literally referred to this comic for “criminally insane” on their website. This might be a use of hyperbole, but I know how heavy metal fans act like. I do appreciate Dark Horse trying to do more real-life people comics (check out SDCC 2016: Muhammad Ali Bio-Comic), but I rather see a series based on more influential people. Do you feel the same? Did I offend anyone reading this because they are a fan of Slayer? Whoops.